Aries begins the zodiacal year and as such is the sign of new beginnings. These headstrong individuals are pioneers both in thought and action, very open to new ideas and lovers of freedom. Challenges are always welcome by members of this sign and they will not be kept from their goals. Courageous leaders with a genuine concern for those they command, Aries are relatively responsible people and it's rare that they use their subordinates to attain their own objectives as leaders however, it can happen. Don't ask members of this sign to be followers or submit to directions because they are too much into taking charge. If they disagree with an opinion, it's not going to be theirs. 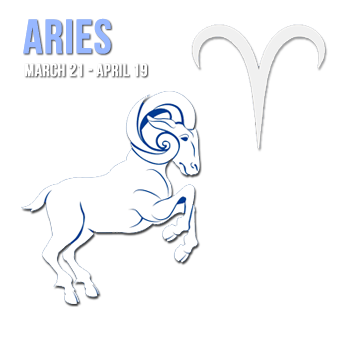 In relationships Aries are enthusiastic, generous, frank, candid and extremely direct. There can be a negative side to their associations with others, though. These "first in line" individuals can easily be irritated by slowness or moderation in their companions and, though they, themselves are sensitive, can ride roughshod over the sensitivities of others. Once committed, however and after starting a family, Arians are highly devoted to their children in the extreme. You will not find a more defensive and loving parent in the entire zodiac. Aries make good athletes. climbers, doctors, explorers (of new ideas as well as uncharted territory, these days including adventuring into outer space), soldiers, sailors, airmen, and leaders, though awkward subordinates, in industry and politics. This is the sign that governs the head and brain, and they are said to be prone to headaches (particularly migraines), sunstroke, neuralgia and depression. Indigestion and nervous disorders are also threats, and rashness, impetuosity and over zealous physical commitment make Aries liable to accidents and physical injuries. The keyword is "extremes;" physical, emotional and mental, and benefit profoundly by experiencing them; but if that extremism goes too far beyond social acceptability, then Aries can expect to be extremely lonely.